The starflower is a beautiful little New England wildflower that thrives in our cool woods and peat-rich soil. We often see them growing next to large trees or rocks in shaded areas. The entire plant measures from four to eight inches tall. The flowers appear in late May to early June… they are small (about a half inch across) and white, with the pointed petals arranged in the shape of a star. 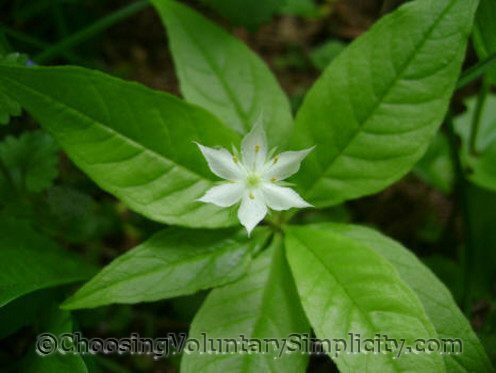 Some people believe that starflowers always have seven petals, seven leaves in the whorl, and seven sepals, but the starflowers in this area don’t follow that pattern and will have anywhere from five to nine petals. This plant has long, narrow leaves that form a single whorl and mirror the arrangement of the flower petals. Very often there will be seven leaves in the whorl, but just as often there will be as few as five or as many as ten leaves. Each plant will have one or two flowers rising above the whorl of leaves on slender stems. My mother-in-love grows these but we have never known what they were. Thank-you so much for identifying them and for the beautiful photos. I’m a regular reader and love your blog. I have read about the 7 leaves and 7 petals but seen 5 to 9 or 10. Its good to have clarification. Keep up the great work. Wonderful photos btw. For Diane — Yes! The pink lady slipper grows in masses in some parts of Maine. I have this flower in my natural garden, planted by nature, the birds and me. I didn’t know what it was called. Thank you, Shirley, now I do. They are so delicate and often overlooked. I love flowers like that. I had a lot of seedlings to put in today and almost gave up before I was done but I thought of you, Shirley, and this blog and all the hard work you have ahead of you with that wood. And I’ll be darned if I will think my work is difficult. You inspire me not to quit when the chores seem daunting. What a beautiful photograph and a delightful plant. It’s not something I’ve ever seen before, coming from “Old England”, so that’s quite a treat. Thankyou.